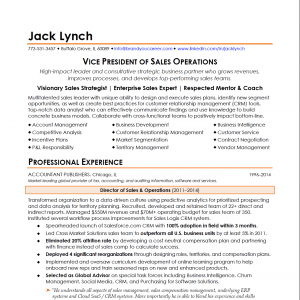 Jack came to me with a resume that did not position him in a way that shouted senior management. First, he had a traditional objective statement at the top of his resume. Second, he had some achievements bulleted out in his resume, but there was not a lot of context around them so readers could appreciate the value of what he did. So, I wrote a summary that featured his target title, a personal branded tagline along with details to show the value he can bring to an employer. For his experience section, I wrote a few lines incorporating the scope of his role followed by achievements, bolding the highlights to make things easy to scan. I also included some excerpts from his LinkedIn testimonials to show the support he had from his peers and team.